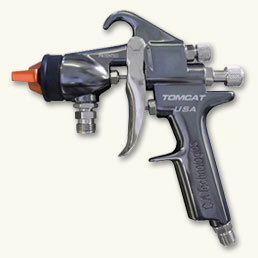 The Tomcat T100C is an economical general purpose conventional air spray gun for spraying a wide range of coatings. Designed for production use, the TOMCAT is perfect for all coatings from thin to thick, stains to glue. Can also be used with internal mix nozzles as well as carbide tipped fluid nozzles for abrasives. This gun features a self-adjusting needle packing, inexpensive nozzle replacement and rugged construction.